Store all of your app’s data, including video, images, and files, with ApiOmat’s built in database. ApiOmat provides data persistency for every app, allowing you to store any data type and make it accessible via the app’s generate API and SDKs. ApiOmat uses the speed and power of a NoSQL database while allowing you to query using an SQL-based syntax. Each App backend in ApiOmat is assigned with individual databases for live, staging and test environments. Also, ApiOmat stores metadata in a global database, allowing you to share data between apps. ApiOmat stores data in a MongoDB that can be deployed for replication or sharding and can handle thousands of requests per millisecond to deliver data quickly during peak traffic. Each app has its own databases per system and lets you quickly copy data from one environment to another. Query through your data by using an SQL-based syntax. ApiOmat stores metadata-like classes in a global database, making it possible to share data between apps using global classes. ApiOmat using grifds to store binary data in the database system. 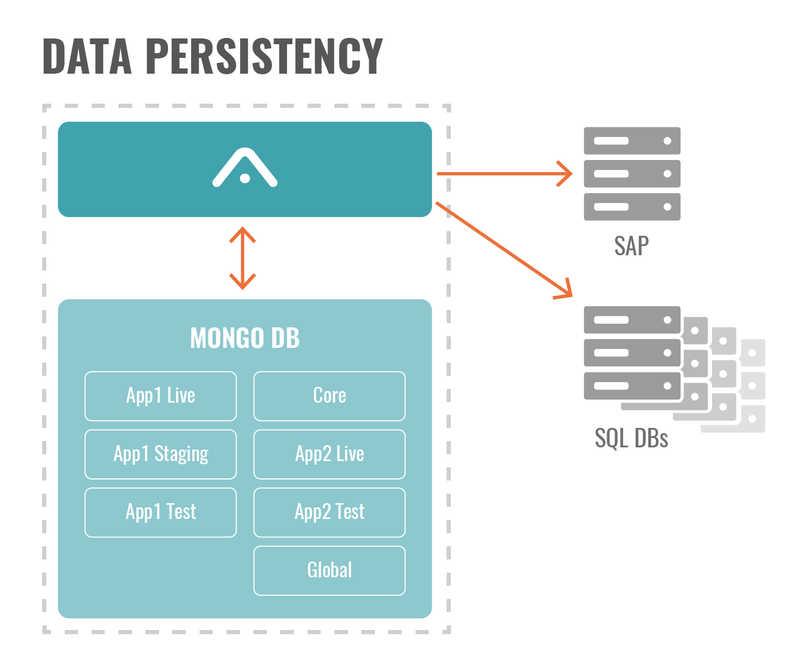 ApiOmat uses a MongoDB database as persistence layer and for caching purposes when working with other data sources like JDBC. MongoDB itself provides features used by ApiOmat like location query or distributed storage. In this database system ApiOmat uses a central database called apiomat to store class information, customers and apps. The data for each app is stored in separate databases, one per system. That is, for the backend MyApp1, ApiOmat will create a database MyApp1 (LIVE system), MyApp1STAGING and MyApp1TEST. This eases separate backups and restores as well as data separation. Backup and restore are possible either via Dashboard using the Restore Module or on a system level utilizing tools installed together with MongoDB as well as other tools from third party vendors. To query data, ApiOmat provides an SQL-based query language which does not force users to learn complex No-SQL querying. Queries are translated internally and can be forwarded to other data sources as well.